✼ 9/20/2012 - Oct. 15, 2012 - Blog Action Day - Theme: "The Power of We"
Today, while googling exercise bike-related stuff, I stumbled across a news story about a bike which can produce 24 hours of electricity from 1 hour of pedaling! I am very interested in getting one to ride myself when they're available. I'm unhappy that the election was rigged against Bernie Sanders, so, I'm going to participate in DemExit by exiting the Democratic Party. I don't yet know who I'll vote for. I recently heard that George Washington thought political parties are a bad idea in general. And I never liked the fact that many people instantly make snap judgments and jump to wild conclusions about people and issues based on a single-word label like "Democrat" or "Republican". So, maybe I'll just stay out of every party from now on. I finally glanced at the website of presidential candidate Bernie Sanders. I haven't read most of his website so far, but, to my surprise, I was quite disappointed by this page about student loan debt. Much of it's good, but I think it doesn't go far enough. I think all existing student loan debt should be canceled completely, and everyone who ever paid student loans should be paid full reparations, plus extra for all the damage done to borrowers and their families due to being deprived of much-needed money we all never should have had to spend in the first place. I don't have student loan debt myself, since my severe sleep issues and shyness dissuaded me from even trying very hard to go to college. But I say "we" because my various relatives' student loans have definitely worsened all our lives. So, I think just lowering interest rates and letting people "refinance" their student loans is nowhere near good enough to correct the injustices that have been inflicted upon all recipients of student loans and their families. Addition, 5:53 AM EST. Hillary Clinton's page on student loans is even more disappointing, but I'm not surprised by that. Addition, March 18, 2016, 1:30 AM. Despite this blog post, I still voted for Bernie in the primary election on March 15th. I finally quit another Service as a Software Substitute (SaaSS) - namely, Tumblr. That was more difficult than quitting Twitter, because I actually enjoyed Tumblr a lot more than Twitter. But not as much as I enjoy having total control over the software I use, and not being a "digital sharecropper" or feudal serf on someone else's website. Plus, most any social media site probably has privacy issues that I should probably be more concerned about than I usually am. And even if a website has not-so-objectionable Terms of Service at the moment, you never know when that might change. At least I mostly just reblogged other people's posts rather than posting my own original stuff to Tumblr. But it still definitely wasn't the most worthwhile use of my time and energy. I can't deny that Tumblr was fun, but, another problem is that many of its pages load aggravatingly slowly in comparison to Astroblahhh Desktop and WordsPlatz. Tumblr works better for me in the Pale Moon web browser than Firefox, but Tumblr still crashed my web browser much too easily. And I much prefer being able to totally avoid even looking at things like follower counts and other statistics, but that was tough to avoid on Tumblr. Many people love to look at things like that, but I'd probably get (more) stage fright if I knew I had tons of readers. Though on the other hand, I tend to feel a bit disappointed (though also somewhat relieved) anytime I see my statistics are pathetic. And even though unfollowing is probably usually nothing personal on Tumblr (and more of a way to deal with Tumblr's lack of a Twitter-like Lists feature), I never liked to see my follower count go down, even though I think it was usually because of spam accounts getting deleted, or people quitting Tumblr. I actually don't like the idea of follower lists or friends lists on any website. They cause too many totally unnecessary, avoidable hurt feelings when people get "unfriended" or never "friended" in the first place. In many ways, I already like Astroblahhh Desktop and WordsPlatz much more than Tumblr (and lots of other things), so I'm sure that given the time and inclination, I would be able to build a free (as in freedom), libre, open source substitute for Tumblr which I would find perfectly satisfactory. Though that will probably take a while, especially since I want to first finish updating at least my Puppy Linux Setup Kit and Astroblahhh Desktop. But I definitely someday want to make it even easier to update my websites than my WordsPlatz blog software already does. Similar to multifiles-apmod.el, I think updating Puppy Linux Setup Kit and Astroblahhh Desktop will probably save an immense amount of time in the long run and change at least my own life for the better (since they already have), even though working on them is a slow, tedious chore at the moment, even with the tremendous help of multifiles-apmod.el, GNU Emacs, and the VUE concept mapping software. At least I've finally learned to like Bash more than I used to. Bash is actually not as horrible as I used to think, and I can now actually imagine rewriting much of the setup kit in Bash instead of Perl. I probably won't, but I'm pleased that it now seems like an acceptable, feasible possibility, largely thanks to the jq command-line JSON processor. I forgot to post this before. The final part - part 4 of the replies that I was trying to send in response to the Free Software Foundation (FSF) Vision Survey. Puppy Linux. I'm guessing LibrePup might be the Puppy distro the FSF might be most likely to fully approve of. Perhaps the Effective Altruism movement and 80,000 Hours, which I stumbled across several months ago. I don't know very much about them yet - all I did was sign up for their mailing lists and skim some of their writings. But, just thought I'd point them out. And even the Circadian Sleep Disorders Network. This is actually on topic because lately, tech companies have finally been making more of an effort to decrease the blue light emanating from their products. Blue light is reputed to make it harder to sleep, and might possibly have other even worse negative effects. In November 2015, Apple upset many customers by removing the popular screen-tinting software f.lux from the App Store. (f.lux, unfortunately, is non-libre, but gratis.) Thousands of people (including me) signed a petition about that. Finally, in January 2016, Apple announced a new Night Shift feature in iOS. That's a little progress, at least. But how typical of an uncaring big corporation to arbitrarily suppress an already existing program which helped many people. It's terrible when people have hardly any options but to just beg and hope for a company to eventually get around to doing the right thing. Which are yet more reasons why it's better to use free (as in freedom), libre software and hardware. In the evening on Jan. 31, 2016, soon before I got started on trying to send my responses to the Free Software Foundation (FSF) Vision Survey, I found out I had received a mail on Jan. 31, 2016 at 1:28 PM from Amazon calling me a "Former Amazon Associate", and telling me about a payment of 65 cents. But, it turned out that I had simply missed an email Amazon sent out in October informing affiliates they had to agree to some new thing, or get kicked out of the program. Anyway, I guess it's about time I finally left that program. I just lazily never bothered to quit, even though I removed hopefully all of my Amazon affiliate links maybe a few years ago (not sure when exactly). The 65 cent payment wasn't even from anything recent. In my payment history, the date on that was 11/2/2011, and the transaction was "09/2011 Advertising Fees". Here's part 3 of the replies that I was trying to send in response to the Free Software Foundation (FSF) Vision Survey. I suspect my entire life might have gone better in many ways if I had learned more about free, libre software and hardware earlier in life. And if I had had more access to those things earlier in life, I might have learned much more about programming a lot sooner, and thus had a better chance much sooner in life of being able to make a living. And avoiding closed source, proprietary software and hardware would have probably saved my financially struggling family quite a bit of money over the years. But for a long time, none of us knew any better. So, my family, including numerous children (including me, when I was a child) suffered in part because the closed source, proprietary software and hardware industry took advantage of my family's naive, ignorant willingness to buy their overpriced, liberty-infringing junk. Problems caused by closed-source, proprietary junk also wasted a lot of all our time. Still, I don't consider the closed source, proprietary software and hardware industries the most evil industries in the world. Having closed source, proprietary software and hardware was at least better than having no software and hardware at all, and I did learn plenty despite the many inherent flaws of anything closed source and/or proprietary. Being stuck with a Mac, and very frustrated with not being able to use a ton of software that was available for non-Macs, made me extra-fascinated with cross-platform things like the Inform 6 programming language. Nowadays, there's also Inform 7, which is one of the most unusual and remarkable programming languages I know of. A pity it's closed source despite being gratis. It was probably good that even from a young age, I acquired a quite justified distaste even for non-libre shareware. As a child with no good way to make money to pay for shareware (or most anything else), I felt quite unfairly persecuted by shareware which would do nasty things to try to force you to buy it, like make you waste time waiting for a timer to go away, or make you reinstall the software every 30 days, etc. I didn't like to bother my family to buy me shareware (or anything), and I was so disgusted by those nasty sales tactics that even as a child, I actually became determined to never buy any shareware like that, even if I could ever afford to do so. Even ordinary non-shareware proprietary software didn't annoy me as much back then, though I felt unfairly deprived of that too, because there was pretty much nothing I could do as a child to earn enough money to buy most anything myself. But I guess the shareware annoyed me more because even when I was a child, it seemed so obviously unfair and mean for the shareware authors to go out of their way to build in nuisances to mistreat, annoy, and waste the time of unfortunate people (such as children like me) who were poor through no fault of our own. I didn't need to be harassed into buying those often quite fun and useful (despite being non-libre) programs. In fact, at the time, I would have happily bought them all without being harassed if I simply had enough money, and hadn't been harassed. Nowadays, of course, I'm not happy (or not entirely happy) buying anything which is closed source, or which threatens liberty in any other ways. But as a child, I didn't understand the importance of that stuff yet. I am actually glad I had the chance to use HyperCard, even though I was too young at the time to figure out how to do anything very complicated with that. HyperCard was actually really cool (except for being closed source and non-libre), and I think it's wonderful that HyperCard made it so easy for even average not-very-technical people to create their own software. I can't comfortably afford to remain a paying member. That's the only reason I didn't renew. I'm pleased to see it's now possible to pay $10 a month instead of $120 all at once, but that's still too high for me. I never kept very careful track of my sales, but, I estimate I probably made less than $10 USD total selling the MagnaMural. Perhaps other donations I've received were at least partly inspired by my free/libre software, but hardly anyone sends me notes along with their donations, so I don't actually know the precise reasons why most people donated. Oh, and until the end of July 2011, I used to host someone's non-libre freeware on my website. (Well, one thing was non-libre, and the other was libre.) Someone sent me $15 because of that software, but that's the only donation I'm certain was inspired by that software. At least it was nice to find out that I wasn't really missing out on much of anything by being unable to afford Apple crap. I was surprised by how unimpressive the screen was, even though that particular MacBook was from 2009. Another problem was, I couldn't even open that MacBook to take the hard disk or battery out because the bottom was screwed on with tiny unusual screws which ruined the two mini-screwdrivers I tried to use on them. Just awful, especially compared to how easy it is to take the batteries out of a Toughbook. At least I was able to run Puppy Linux on it. But that still wasn't sufficient justification to keep it instead of selling it and getting some cheap old Toughbooks instead on eBay. I often wish there was a freelance job website similar to http://odesk.com/, but which is exclusively for libre jobs. I've glanced at http://gun.io/, but, I don't know if I'm at a high enough skill level yet to even dare to try to undertake the astonishingly high-paying jobs I've seen on there. And if it turned out any of those jobs were non-libre, I would have to refuse to do them. Also, I'd rather just do small things that I feel more sure I can handle. Or actually, I'd rather just work on my own projects like the Puppy Linux Setup Kit, and yet somehow get paid. A long time ago, I posted various hopefully helpful posts at the FSF's forum. Just thought I'd draw attention to them. I had some technical difficulties sending in my responses to the Free Software Foundation (FSF) Vision Survey at almost literally the last minute. Perhaps it was because my responses were so long. Fortunately, I intended to probably post my replies on my blog anyway. I wrote so much that I'm splitting this into multiple blog posts. GNU Emacs, multfiles-apmod, and various other add-ons have been making it tremendously easier and more enjoyable for me to make progress with my various programming projects. Even my previous favorite text editors (Notepad++ and Geany) were really getting in my way and slowing me down - so, if I hadn't switched to Emacs, I think all my projects might've gotten substantially delayed, and I might even have given up on some of them. Even though it took me almost 2 months of almost daily effort to get cozy with Emacs, I think it will save me quite a lot more time than that in the long run. So, by 2020, I suspect I will have completed more projects and done a much better job of building them than I would have if I hadn't gotten cozy with Emacs, and hadn't enhanced the multifiles add-on. I've been using VUE since 2010 already (or maybe even longer, I can't remember) to make notes, flow charts, etc. It's a great tool for brainstorming and trying to design software, and helps me get a nice, visual overview of things and how they relate to each other. I plan on using it for publicly-released documentation in the future, rather than just my own private notes. Sometimes I think things like news articles could benefit from being in a VUE-like concept-map format. It might make ideas easier to absorb at a glance than conventional articles which might describe numerous complicated ideas in big blobs of text, without visually showing how different things link together or otherwise interact or relate. For a long time I've wished I could edit actual code itself (rather than just notes about code) using VUE. A few months ago I heard about a program called Code Bubbles. I still haven't tried it yet, but, I think Code Bubbles is probably the closest thing I've ever heard of so far to my daydream of being able to use VUE to edit actual code. I've been thinking maybe using XSLT on the XML source code of a VUE file might be able to transform a VUE file containing source code text into actually runnable (or otherwise useable) source code files. So maybe my daydream would be easier to implement than I thought. But VUE still wouldn't have syntax coloring and a ton of other nice features of a normal code editor. One of the most exciting things I found out about in 2015 was graph database software, which is reputed to typically be much faster and easier to work with than conventional relational databases. I still haven't done much with graph databases myself yet, but, I'm looking forward to eventually experimenting more with OrientDB and perhaps Neo4j. Graph databases are another thing I wish I could use VUE as a GUI to work with them. I haven't yet gotten deeply into learning Lisp, but, I still want to because of what I've read about it possibly being the overall best, most powerful programming language in existence. I'm working on making the kit more flexible and easy to update, though it already works remarkably well and has saved me a ton of time. My Puppy Setup Kit makes it so I can go from a totally uncustomized Puppy Linux system to a system customized exactly the way I like it, in just minutes, by clicking a single script. My setup kit also makes it so I'm not so dependent on having to use a specific computer with a specific hard disk, since I can mostly or completely replicate my entire comfortably customized system in minutes on quite different computers. Though sometimes I need to adjust the kit a bit to make that work right, like when I switched to a laptop and then found I had to add some new stuff to make the touchpad work the way I liked. But once I've finished any necessary adjustments, then, from then on, setting up my system is nearly effortless - I just have to click a single script, click a confirmation dialog box, wait a few minutes, and press Enter every once in a while. In the past, when I used an operating system (Windows) installed on an internal hard disk, my computer seriously breaking down tended to be an incredibly stressful disaster, which sometimes took days, weeks, or once over a month to recover from, due to having to struggle to fix whatever broke, and sometimes having to struggle to acquire another computer and then reinstall everything from scratch. And I always absolutely dreaded having to open up my computer for any reason, such as to get the internal hard disk out so I could try to rescue any unbacked-up data. But now, hard disks are optional for me. And if any of my computers ever totally breaks down, I can move to a different one almost seamlessly. I love it! I love it so much I won't even seriously consider going back to relying on any OS installed on a hard disk - not even a GNU/Linux! - because I find it far too easy to accidentally ruin even my GNU/Linux systems by installing things I shouldn't have installed. I never want to return to having to struggle to fix things like that. With my Puppy Setup Kit, all I have to do to get everything back to normal is just reboot, and run my setup kit again. One of the things that deterred me from even trying GNU/Linux for years was being afraid of accidentally ruining my Windows installation by installing GNU/Linux on the same hard drive. Probably lots of Windows and MacOS users are afraid of that. So, I didn't try GNU/Linux until I found out about live discs, which I think I first heard about in 2006 because I was desperately searching for a way to rescue data from a broken-down Windows system. I still didn't end up switching to GNU/Linux until 2011, though. I was pushed into it due to the fact that my hard disk was making odd little noises, which made me think, maybe I should use a Puppy live disc for a while so I can avoid making my hard disk work too hard until I can afford to get a replacement hard disk. But when I found Puppy was so delightfully fast, and so nice to use just from a live disc without even having to install it, I found I actually didn't even want to go back to using primarily Windows again. Windows XP was actually reasonably fast on that computer, but Puppy was (and still is) so fast it made Windows seem annoyingly slow in comparison. Before I made my Puppy Setup Kit, I used to use Puppy's really cool built-in ability to save your custom settings, installed programs, etc. on the Puppy live CD or DVD you booted your computer with just by writing additional sessions to the disc. But the more sessions you have, the slower it becomes to boot, so, eventually, I decided, instead of saving minor settings changes to my disc, I'd just use some Perl scripts to adjust my settings. Thus, my Puppy Setup Kit was born. I think my way of using Puppy is probably still unconventional even amongst Puppy users (partly since I still haven't gone to much trouble to tell the world about my setup kit because I think I should renovate it first). But, this is my favorite, most comfortable computer setup ever. I finally don't have to live in as much fear of my hard disk or computer breaking down, because it's so simple now to just switch to another computer and have everything be pretty much the same. And Puppy, running in a RAM disk, is the fastest OS I've ever used. Even a 1.5 GHz single core laptop with only 2 GB of RAM running Lucid Puppy 5.2.8 version 004 seems tremendously faster than the single core 2.0 GHz 1 GB RAM Windows Vista computer of someone I know, which frequently gets stuck for minutes on end on things that Puppy does in literally seconds, like opening programs or going to certain web pages. Once my Puppy Setup Kit is renovated, it will be a lot easier for me to share my current exact setup with anyone who wants to try it, and also for me (and hopefully anyone) to add to the kit to make it possible to easily install whatever sets of software and settings anyone wants to install. So, maybe I'll finally be able to persuade some of the more stubborn Windows and Mac users I know to try Puppy. And with the renovated Puppy Setup Kit, hopefully everyone (including me) will have a much easier time customizing our own Puppies to work exactly the way we want. I'd also like to make it possible to write Puppy Setup Kit scripts in any language, not just Bash or Perl. Not sure yet how to do that, but, maybe if I store details about installable software, settings, etc. in JSON files, that will make the data accessible by most languages. I think it would be good if people were less dependent on downloading precompiled binaries via package manager software. It's always good to know how to do things yourself rather than having to depend on other people to do things for you. And it's also safer to compile things from source code rather than to just trust that the package builder and/or the repository are trustworthy/uncompromised. Plus, things compiled from scratch conceivably might work better for you because of being tailored to your exact system, instead of the possibly quite different system of whoever built a package. So, I think it would be good if more people learned how to compile things themselves from source code, and also would be good if people had some partially automated tools to help with the boring, automatable parts of the process of compiling your own package from source code. ...and thereby also make it possible for people to easily install and use the not-yet-complete renovated version of Astroblahhh Desktop, among other things. The build-your-own-packages-from-source features will also make it possible for me (and/or others) to help popularize things like (for example) GNU Guile by making them extremely easy to compile from source and install. Recently, I was very pleased to hear about the $5 version of the Raspberry Pi. I'd be very interested to see a list of cool cheap hardware gizmos which the FSF approves of. 1 GB is a bit better (and even good enough to run a Windows XP VirtualBox reasonably well, at least if VirtualBox is almost the only thing you install), but that still forces me to make difficult choices amongst what software I want to install, and I have to reboot to install different sets of software and settings. 2 GB of RAM is sort of OK, but I much prefer 4 GB or more. The more, the better. So, I'd much prefer to get a small cheap Pi-like gizmo with a lot more RAM than a Pi. I'm also very happy that Puppy Linux is also systemd-free and will hopefully stay that way. Today, the 2014 Food Revolution Summit is starting. By the way, I'm Apollia112 there, not Apollia. And, for the first time since 2009, I updated Prosperity.Astroblahhh.Com with a little news. 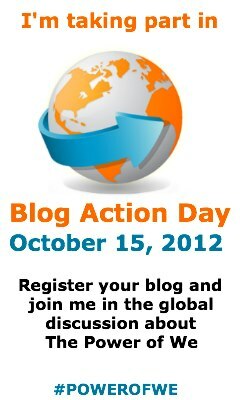 Oct. 15, 2012 - Blog Action Day - Theme: "The Power of We"
This morning at about 8:30 AM, I registered to participate in Blog Action Day, which will happen October 15th, 2012. The theme this year is The Power of We. A nice, broad theme which should make it possible to write about just about any world issue(s) you might want to write about. To celebrate the �power of we�, Greenpeace is for the first time opening up our entire visual archive for free to the global blogging community for Blog Action Day � over 150,000 photos and videos.